Bath’s newest permanent artwork has been unveiled at Bath Riverside in a tribute to two of the city’s most famous residents. 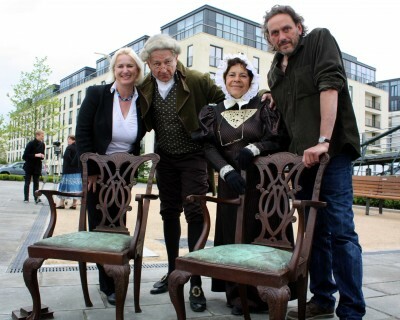 Two bronze cast Georgian-style chairs have been installed next to Victoria Bridge at Bath Riverside to commemorate the work of William and Caroline Herschel. William Herschel was an accomplished musician and astronomer, and is credited for the discovery of the 7th star, Uranus, in 1781. His sister, Caroline Herschel would often sit outside their Bath home assisting William as he studied the night sky through home-made telescopes. Their work was the inspiration for local artist Patrick Haines who was commissioned by Crest Nicholson Regeneration to create an artwork for Bath Riverside. Patrick said, “When I was asked to create a new work for the riverside development it gave me the opportunity to take a period object such as a Georgian chair and take it outside to interact with the river view and night time stars. The chairs are positioned adjacent to the river, and are just one of many permanent art installations located in and around Bath’s newest residential quarter. The artwork was unveiled on Friday at a ceremony at Bath Riverside. For more information and to see a video of the unveiling, visit the Bath Riverside Community Facebook page.